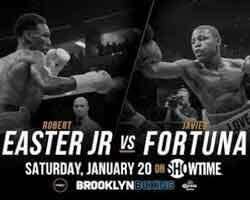 Review by AllTheBestFights.com: 2018-01-20, close fight but not so exciting: Robert Easter Jr vs Javier Fortuna gets two stars. The undefeated Ibf Lw champion Robert Easter Jr entered this fight with a perfect boxing record of 20-0-0 (14 knockouts) and he is ranked as the No.2 lightweight in the world (currently the #1 in this division is Mikey Garcia). He won the vacant Ibf title in 2016 against Richard Commey (=Easter Jr vs Commey) and he defended it twice in 2017: with Luis Cruz (=Easter vs Cruz) and Denis Shafikov (=Shafikov vs Easter Jr). His opponent, the former world champion in two different weight classes Javier Fortuna, has a record of 33-1-1 (23 knockouts) and he entered as the No.10 in the same weight class. He suffered his only loss when he faced Jason Sosa in 2016 (=Fortuna vs Sosa), since then he has beat Marlyn Cabrera, Omar Douglas (=Fortuna vs Douglas), Mario Beltre and Nicolas Polanco. Easter vs Fortuna is valid for the IBF World lightweight title (Easter’s third defense – belt on the line just for Easter since Fortuna was overweight at the weigh-in); undercard of Errol Spence Jr vs Lamont Peterson. Watch the video and rate this fight!